This page is in Engrish. 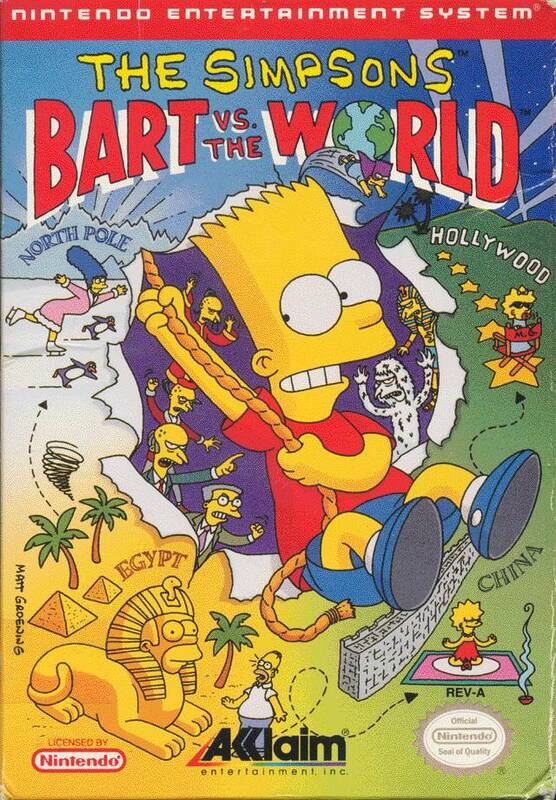 The Simpsons: Bart vs. the World is a Simpsons video game that was release in December 1991 and 1992. Bart Simpson wins an art contest at the Krusty the Clown Show. His prize is a World Wide Krusty the Clown Treasure Hunt for his entire family. The contest was fixed by the sponsor and judge Mr. Burns. Burns has been losing millions dollars since Homer Simpson was hired. After exhaustive research, Mr. Burns hatched the contest scheme, enlisting the aid of his ruthless relatives around the world to help wipe the Simpsons off the very face of Earth. Their first stop is China where Mr. Burns taking help from his third cousin, Fu Manchu Burns. After the family manage to beet him ask Mr. Burns, Smithers to call the North Pole and his second cousin's nephew's son Abominable Snow Burns. When he can not handle the family, he contacts his grand-uncle on his mother's side Ramses Burns of Eygpt. Burns asks then Smithers then call his Hollywood relative Eric Von Burns. After the trip, Bart visit the Krusty the Clown Show, where he should personally congratulation Mr. Burns and Smithers and he does it by throwing a pie in the face of Mr. Burns and Smithers. The first part of China is in The Junk, a Chinese ship where Bart will try to get to the top of the sail, on the way there, he is attacked by fireworks and angry Chinese. Bart visit then The Great Wall where he is skateboarding, well there he gets attacked by a Chinese dragon, more Chinese and most avoid trap doors and fireworks. Bart must also solve a memory that consists of 16 cards and he get five attempts and a sliding puzzle. For leave China must Bart defeat Fu Manchu Burns, which protecting himself with a hand fan and he throw fire balls at Bart, while Bart shoots his slingshot against him. At the North Pole visits Bart first The Ice Cave' where he must dodge falling icicles, flying snowflakes and holes at the ground. In The Frozen River must Bart jumps between ice floes when they appears in the lake and then must avoid the seagulls. In Igloo Shell Game must Maggie find in which of the the three igloo as Krusty Collectible face is hidden and Bart must in the level solve another one sliding puzzle. For leave the North Pole must Bart jump on Abominable Snow Burns when he shows up from one of three holes in the ice but he must avoid icicles and ice balls that he throws. In Egypt, The Valley of the Kings where Bart walking in the desert and must avoid sandstorms, scorpions and falling boulders. When Bart here assumes the Bartman mask he starts to fly and have to do it to get out of the cave he ended up in and in the level must Bart solve another one sliding puzzle. The family also visit The Sphnix, where Bart is in the Sphnix he must climb to the top and avoid the Egyptian dragon and cobras, after Bart is dressed as Bartman, he can flies to the top. For leave the Egypt must Bart avoid Ramses Burns, which flying on a carpet and throwing canes against him. Bart must in the same time pull out the sewing thread from Ramses carpet. 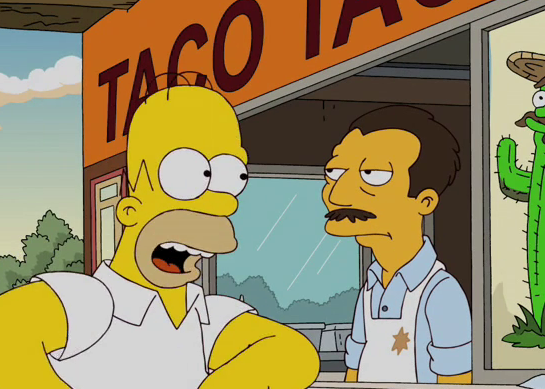 In Hollywood, the last level visit Bart the Moe's and he must avoid bottles and beer glass that Moe throws against Bart. In Find The Bats should Bart opened three coffin in the correct order to win 3 Krusty collectibles. In the first Soundstage is Bart on a pirate ship and must avoid the rats, parrots, pirates and the cannons on the ship. After he reached the deck, he must climb up the pole and must then avoid the holes in the sail and the flying seagulls. After he reaches the top he begins to fly like Bartman. In the second Soundstage is Bart in a scary forest where he must avoid torches and bats and shoot down the jumping statues. After Bart come to the cemetery he must avoided the dead, after he jumps down the to underground he also must avoid insects. For leave the Hollywood must Bart avoid Eric Von Burns megaphones are his throws while Bart must shooting the slingshot on him. The game is a 2D side-scrolling action platformer. Modified on March 31, 2013, at 16:12.